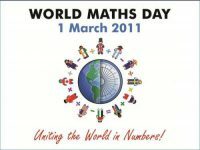 Several Bristol schools are celebrating World Maths Day this month (March), joining millions of pupils from across the globe, in an attempt to get their class at the top of the international league tables. The competition runs online in three age categories. This year, more than two million pupils from 37,0000 schools across 200 countries will take part, answering more than 500,000,000 questions. In Bristol to celebrate the event schools have organised maths activities through the week. Orchard School will be running their own quiz in tutor groups and a poster treasure hunt with maths puzzles. Oasis Brightstowe Academy will be running the online competition – last year they reached 19th in the world at one stage. The Bridge Learning Campus also have tutor-time quizzes. Fairfield School are celebrating later in the month with a maths week involving local visits and workshops, quizzes and numeracy built in to every lesson plan.